I’ve talked about Data Preparation many times in conferences such as PASS Summit, BA Conference, and many other conferences. Every time I talk about this I realize how much more I need to explain this. Data Preparation tips are basic, but very important. In my opinion as someone who worked with BI systems more than 15 years, this is the most important task in building in BI system. 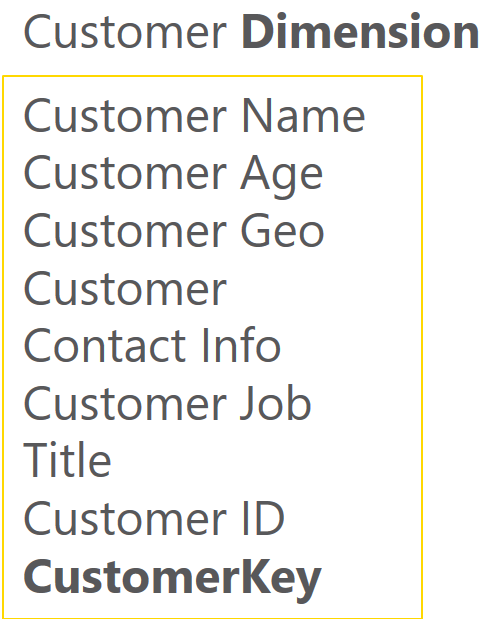 In this post I’ll explain why data preparation is necessary and what are five basic steps you need to be aware of when building a data model with Power BI (or any other BI tools). This post is totally conceptual, and you can apply these rules on any tools. All of us have seen many data models like screenshot below. Transactional databases has the nature of many tables and relationship between tables. Transactional databases are build for CRUD operations (Create, Retrieve, Update, Delete rows). Because of this single purpose, transactional databases are build in Normalized way, to reduce redundancy and increase consistency of the data. For example there should be one table for Product Category with a Key related to a Product Table, because then whenever a product category name changes there is only one record to update and all products related to that will be updated automatically because they are just using the key. There are books to read if you are interested in how database normalization works. Too many tables and many relationship between tables makes a reporting query (that might use 20 of these tables at once) very slow and not efficient. This model is far simpler and faster. 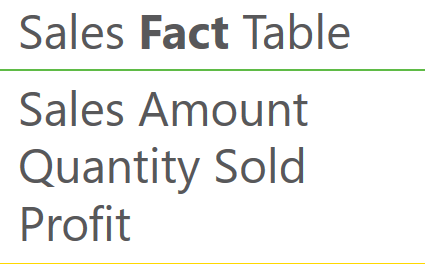 There is one table that keeps sales information (Fact_Sales), and few other tables which keep descriptions (such as Product description, name, brand, and category). There is one one relationship that connects the table in the middle (Fact) to tables around (Dimensions). This is the best model to work with in a BI system. This model is called Star Schema. Building a star schema or dimensional modeling is your most important task as a BI developer. How to Design a Star Schema? To build a star schema for your data model I strongly suggest you to take one step at a time. What I mean by that is choosing one or few use cases and start building the model for that. 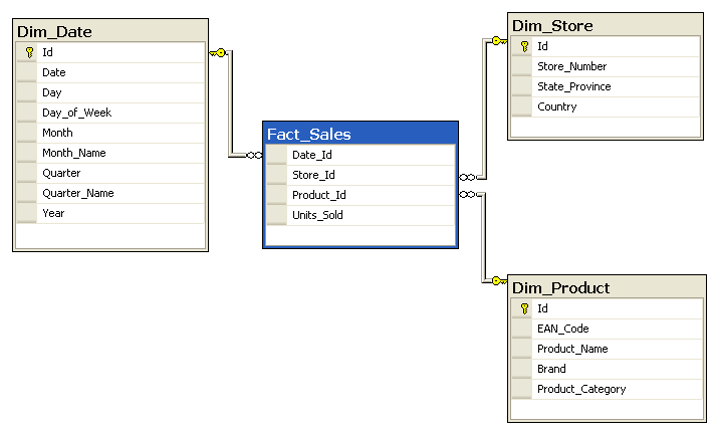 For example; instead of building a data model for the whole Dynamics AX or CRM which might have more than thousands of tables, just choose Sales side of it, or Purchasing, or GL. After choosing one subject area (for example Sales), then start building the model for it considering what is required for the analysis. Any descriptive information will be kept in Dimension tables. For example; customer name, customer age, customer geo information, customer contact information, customer job, customer id, and any other customer related information will be kept in a table named Customer Dimension. Codes (or IDs) in source system might be Text not Integer. Short Int, Int, or Big Int are best data types for surrogate key because these are values which will be used in the fact table. Because fact table is the largest table in the data set, it is important to keep it in the smallest size possible (using Int data types for dimension foreign keys is one of the main ways of doing that). Codes (or IDs) might be recycled. You might want to keep track of changes (Slowly Changing Dimension), so one ID or Code might be used for multiple rows. Other dimensions should be also added in the same way. in example below a Date Dimension and Product Dimension is also created. You can easily see in the screenshot below that why it is called star schema; Fact table is in the middle and all other dimensions are around with one relationship from fact table to other dimensions. Tables can be joined together to create more flatten and simpler structure. Fact table are the largest entities in your model. Flattening them will make them even larger! names such as std_id, or dimStudent are confusing for users. Some data types are spending memory (and CPU) like decimals. 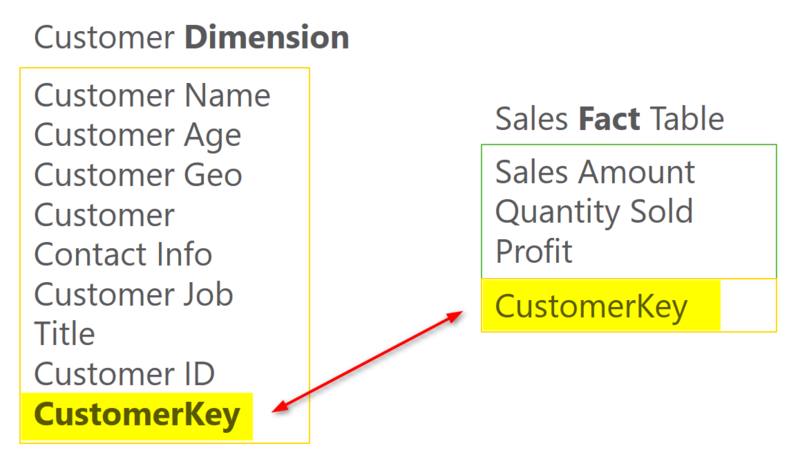 Appropriate data types are also helpful for engines such as Q&A in Power BI which are working based on the data model. Filtering part of the data before loading it into memory is cost and performance effective. Solution: DO Filter part of the data that is not required. This was just a very quick introduction to data preparation with some tips. 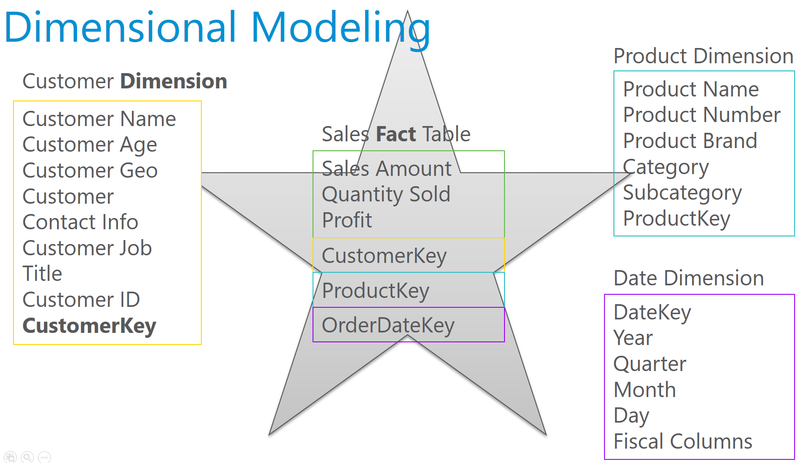 This is beginning of blog post series I will write in the future about principles of dimensional modeling and how to use them in Power BI or any other BI tools. You can definitely build a BI solution without using these concepts and principles, but your BI system will slow down and users will suffer from using it after few months, I’ll give you my word on it. Stay tuned for future posts on this subject. Reza Rad is a Microsoft Regional Director, an Author, Trainer, Speaker and Consultant. He has a BSc in Computer engineering; he has more than 20 years’ experience in data analysis, BI, databases, programming, and development mostly on Microsoft technologies. He is a Microsoft Data Platform MVP for eight continuous years (from 2011 till now) for his dedication in Microsoft BI. Reza is an active blogger and co-founder of RADACAD. Reza is also co-founder and co-organizer of Difinity conference in New Zealand. His articles on different aspects of technologies, especially on MS BI, can be found on his blog: https://www.radacad.com/blog. He wrote some books on MS SQL BI and also is writing some others, He was also an active member on online technical forums such as MSDN and Experts-Exchange, and was a moderator of MSDN SQL Server forums, and is an MCP, MCSE, and MCITP of BI. He is the leader of the New Zealand Business Intelligence users group. He is also the author of very popular book Power BI from Rookie to Rock Star, which is free with more than 1700 pages of content and the Power BI Pro Architecture published by Apress. He is an International Speaker in Microsoft Ignite, Microsoft Business Applications Summit, Data Insight Summit, PASS Summit, SQL Saturday and SQL user groups. And He is a Microsoft Certified Trainer. Reza’s passion is to help you find the best data solution, he is Data enthusiast. Completely agree with tip number 3. Might be a bit off topic; I’m always annoyed with the decision to put ‘technical’ naming convention in Data Warehouse. But it’s so hard to argue with other BI developers because they think it’s simple, therefore it’s not that important. Whereas in reality, a good naming convention is very important for business people, especially when we want to achieve the so called “Single Source of Truth”. Thanks for your feedback. The data warehouse naming can be still ‘technical’. However there should be views on top of that. or even in the model itself some renaming. that change those to business understand-able names. I agree that a star scheme is creating a lot of clarity in the model, but sometimes it just doesn’t allow you to create more complex models. So what to do when you have more than one fact tables, where there’s also relationships between various dimensions directly? If you have designed the model in the right way, your dimensions should not be related to each other. You have to flatten dimensions. If still considering that you do need to connect two or more dimensions separately (not through the fact table), then it means you probably need another fact table too. Your data mart should be a net or mesh of star schemas. 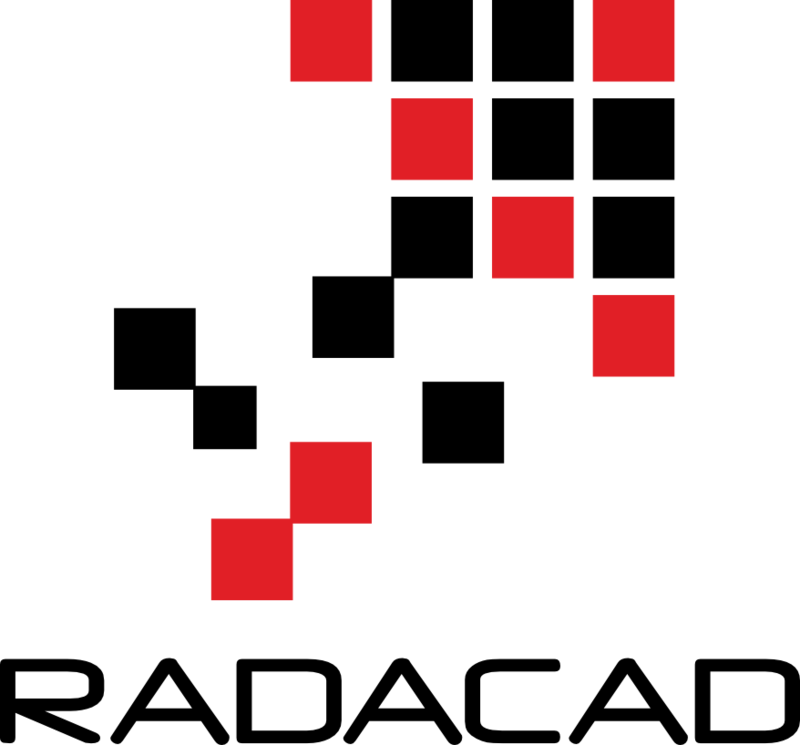 No two fact tables connected to each other, and no two dimensions connected to each other. fact-dim relationships only. And believe me, this can work for a complex and sophisticated model. The design of such a model, however, takes time. © 2019 RADACAD All Rights Reserved.